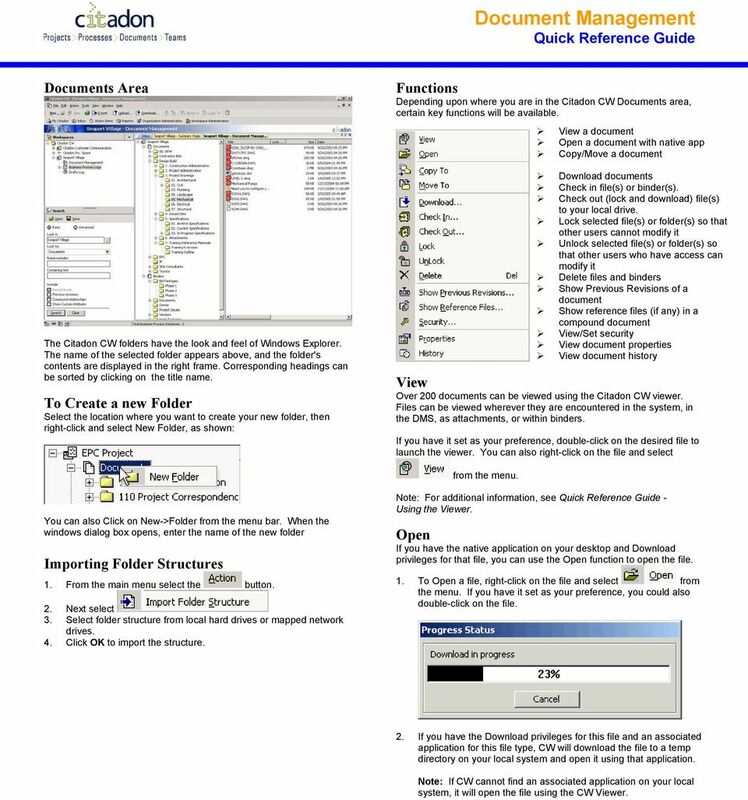 Download "Document Management Quick Reference Guide"
1 Documents Area The Citadon CW folders have the look and feel of Windows Explorer. The name of the selected folder appears above, and the folder's contents are displayed in the right frame. Corresponding headings can be sorted by clicking on the title name. To Create a new Folder Select the location where you want to create your new folder, then right-click and select New Folder, as shown: Functions Depending upon where you are in the Citadon CW Documents area, certain key functions will be available. 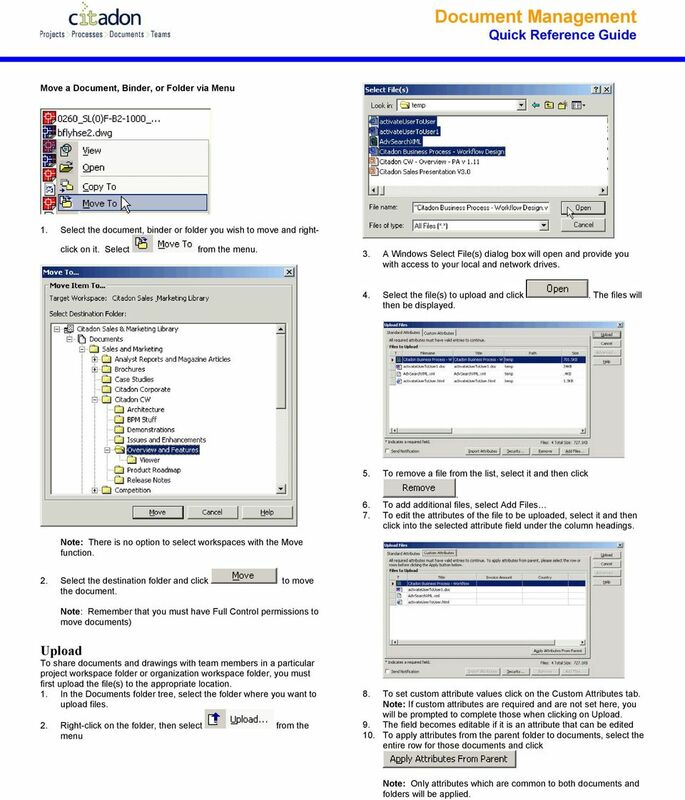 View a document Open a document with native app Copy/Move a document Download documents Check in file(s) or binder(s). Check out (lock and download) file(s) to your local drive. Lock selected file(s) or folder(s) so that other users cannot modify it Unlock selected file(s) or folder(s) so that other users who have access can modify it Delete files and binders Show Previous Revisions of a document Show reference files (if any) in a compound document View/Set security View document properties View document history View Over 200 documents can be viewed using the Citadon CW viewer. Files can be viewed wherever they are encountered in the system, in the DMS, as attachments, or within binders. If you have it set as your preference, double-click on the desired file to launch the viewer. You can also right-click on the file and select You can also Click on New->Folder from the menu bar. When the windows dialog box opens, enter the name of the new folder Importing Folder Structures 1. From the main menu select the button. 2. Next select 3. Select folder structure from local hard drives or mapped network drives. 4. Click OK to import the structure. Note: For additional information, see - Using the Viewer. Open If you have the native application on your desktop and Download privileges for that file, you can use the Open function to open the file. 1. To Open a file, right-click on the file and select from the menu. If you have it set as your preference, you could also double-click on the file. 2. If you have the Download privileges for this file and an associated application for this file type, CW will download the file to a temp directory on your local system and open it using that application. Note: If CW cannot find an associated application on your local system, it will open the file using the CW Viewer. 3 Move a Document, Binder, or Folder via Menu 1. Select the document, binder or folder you wish to move and rightclick on it. Select 3. A Windows Select File(s) dialog box will open and provide you with access to your local and network drives. 4. Select the file(s) to upload and click. The files will then be displayed. 5. To remove a file from the list, select it and then click. 6. To add additional files, select Add Files 7. To edit the attributes of the file to be uploaded, select it and then click into the selected attribute field under the column headings. Note: There is no option to select workspaces with the Move function. 2. Select the destination folder and click to move the document. Note: Remember that you must have Full Control permissions to move documents) Upload To share documents and drawings with team members in a particular project workspace folder or organization workspace folder, you must first upload the file(s) to the appropriate location. 1. In the Documents folder tree, select the folder where you want to upload files. 2. Right-click on the folder, then select from the menu 8. To set custom attribute values click on the Custom Attributes tab. Note: If custom attributes are required and are not set here, you will be prompted to complete those when clicking on Upload. 9. The field becomes editable if it is an attribute that can be edited 10. To apply attributes from the parent folder to documents, select the entire row for those documents and click Note: Only attributes which are common to both documents and folders will be applied. 4 11. To change the security of a file, click. 1. In the workspace document structure, select the document(s) you wish to Check In. 2. Right-click on the document and then select 12. To send notification of the upload to those who have access to the target folder check the Send Notification box. 13. To complete the upload, click or click to discontinue the upload. Download Documents and Binders can be downloaded from a particular Workspace Folder to a local or network drive. 1. In the Documents folder tree, select the folder that contains the files you want to download. 2. Select the file(s) to download. 3. Right-click and select 4. In the Download/Check-Out dialog box, select the local folder to receive the downloaded files and click. If the downloaded file has the same name as a file in the local download folder, the local file is overwritten. Check Out Document After a document has been added to a project workspace folder or organization workspace folder, members who have permission to edit will Check Out the file from Citadon CW s document management system. 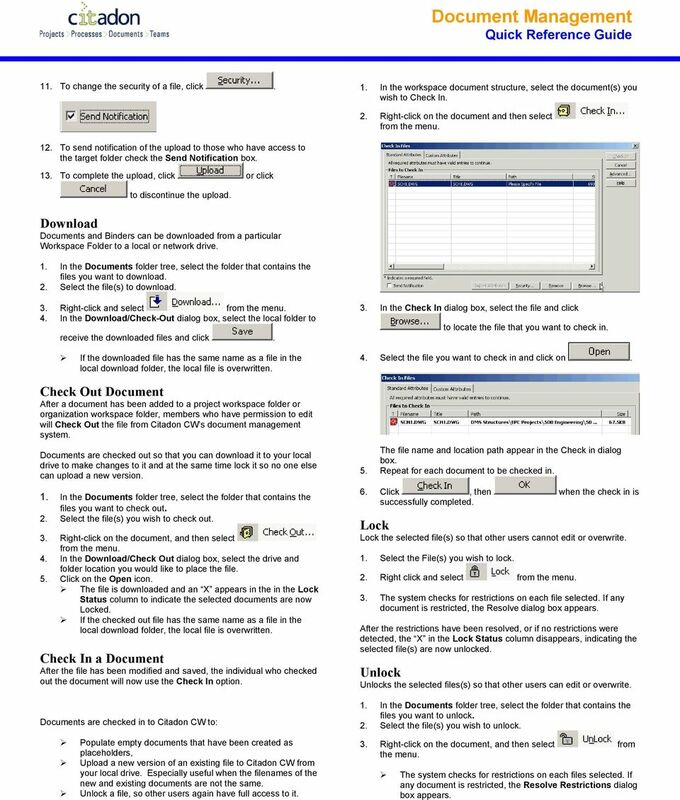 Documents are checked out so that you can download it to your local drive to make changes to it and at the same time lock it so no one else can upload a new version. 1. In the Documents folder tree, select the folder that contains the files you want to check out. 2. Select the file(s) you wish to check out. 3. Right-click on the document, and then select 4. In the Download/Check Out dialog box, select the drive and folder location you would like to place the file. 5. Click on the Open icon. The file is downloaded and an X appears in the in the Lock Status column to indicate the selected documents are now Locked. If the checked out file has the same name as a file in the local download folder, the local file is overwritten. Check In a Document After the file has been modified and saved, the individual who checked out the document will now use the Check In option. 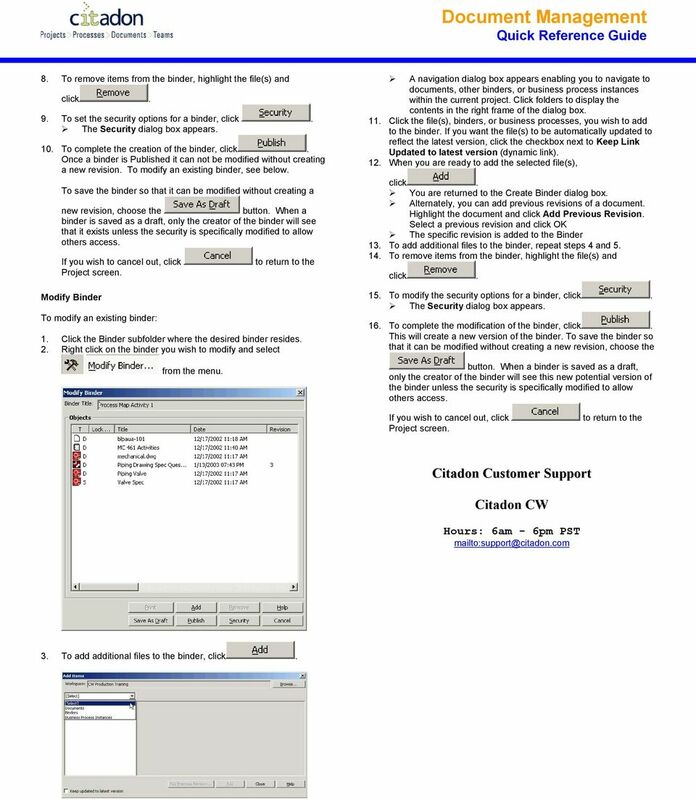 Documents are checked in to Citadon CW to: Populate empty documents that have been created as placeholders, Upload a new version of an existing file to Citadon CW from your local drive. Especially useful when the filenames of the new and existing documents are not the same. Unlock a file, so other users again have full access to it. 3. In the Check In dialog box, select the file and click to locate the file that you want to check in. 4. Select the file you want to check in and click on. The file name and location path appear in the Check in dialog box. 5. Repeat for each document to be checked in. 6. Click, then when the check in is successfully completed. Lock Lock the selected file(s) so that other users cannot edit or overwrite. 1. Select the File(s) you wish to lock. 2. Right click and select 3. The system checks for restrictions on each file selected. If any document is restricted, the Resolve dialog box appears. After the restrictions have been resolved, or if no restrictions were detected, the X in the Lock Status column disappears, indicating the selected file(s) are now unlocked. Unlock Unlocks the selected files(s) so that other users can edit or overwrite. 1. In the Documents folder tree, select the folder that contains the files you want to unlock. 2. Select the file(s) you wish to unlock. 3. Right-click on the document, and then select from the menu. The system checks for restrictions on each files selected. If any document is restricted, the Resolve Restrictions dialog box appears. 5 After the restrictions have been resolved, or if no restrictions were detected, the X in the Lock Status column disappears, indicating the selected file(s) are now unlocked. 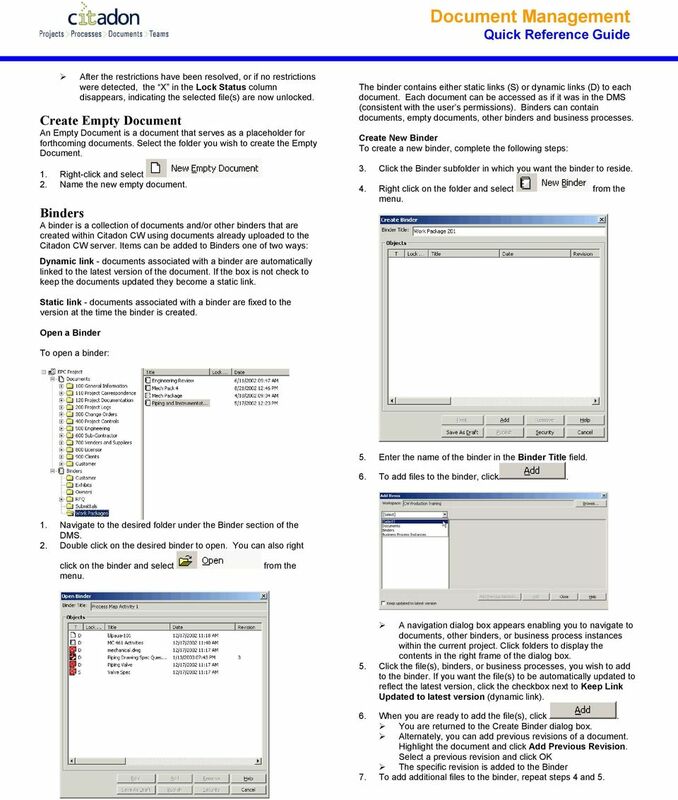 Create Empty Document An Empty Document is a document that serves as a placeholder for forthcoming documents. Select the folder you wish to create the Empty Document. 1. Right-click and select 2. Name the new empty document. 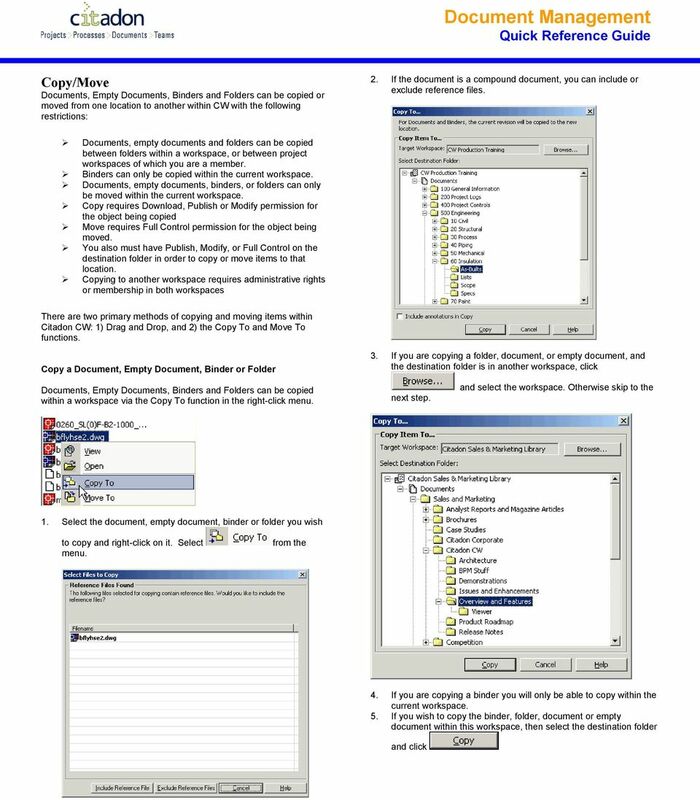 Binders A binder is a collection of documents and/or other binders that are created within Citadon CW using documents already uploaded to the Citadon CW server. Items can be added to Binders one of two ways: Dynamic link - documents associated with a binder are automatically linked to the latest version of the document. If the box is not check to keep the documents updated they become a static link. The binder contains either static links (S) or dynamic links (D) to each document. Each document can be accessed as if it was in the DMS (consistent with the user s permissions). Binders can contain documents, empty documents, other binders and business processes. Create New Binder To create a new binder, complete the following steps: 3. Click the Binder subfolder in which you want the binder to reside. 4. Right click on the folder and select from the menu. Static link - documents associated with a binder are fixed to the version at the time the binder is created. Open a Binder To open a binder: 5. Enter the name of the binder in the Binder Title field. 6. To add files to the binder, click. 1. Navigate to the desired folder under the Binder section of the DMS. 2. Double click on the desired binder to open. You can also right click on the binder and select menu. from the A navigation dialog box appears enabling you to navigate to documents, other binders, or business process instances within the current project. Click folders to display the contents in the right frame of the dialog box. 5. Click the file(s), binders, or business processes, you wish to add to the binder. If you want the file(s) to be automatically updated to reflect the latest version, click the checkbox next to Keep Link Updated to latest version (dynamic link). 6. When you are ready to add the file(s), click. You are returned to the Create Binder dialog box. Alternately, you can add previous revisions of a document. Highlight the document and click Add Previous Revision. Select a previous revision and click OK The specific revision is added to the Binder 7. To add additional files to the binder, repeat steps 4 and 5. 6 8. To remove items from the binder, highlight the file(s) and click. 9. To set the security options for a binder, click. The Security dialog box appears. 10. To complete the creation of the binder, click. Once a binder is Published it can not be modified without creating a new revision. To modify an existing binder, see below. To save the binder so that it can be modified without creating a new revision, choose the button. When a binder is saved as a draft, only the creator of the binder will see that it exists unless the security is specifically modified to allow others access. If you wish to cancel out, click Project screen. Modify Binder To modify an existing binder: to return to the 1. Click the Binder subfolder where the desired binder resides. 2. Right click on the binder you wish to modify and select A navigation dialog box appears enabling you to navigate to documents, other binders, or business process instances within the current project. Click folders to display the contents in the right frame of the dialog box. 11. Click the file(s), binders, or business processes, you wish to add to the binder. If you want the file(s) to be automatically updated to reflect the latest version, click the checkbox next to Keep Link Updated to latest version (dynamic link). 12. When you are ready to add the selected file(s), click. You are returned to the Create Binder dialog box. Alternately, you can add previous revisions of a document. Highlight the document and click Add Previous Revision. Select a previous revision and click OK The specific revision is added to the Binder 13. To add additional files to the binder, repeat steps 4 and To remove items from the binder, highlight the file(s) and click. 15. To modify the security options for a binder, click. The Security dialog box appears. 16. To complete the modification of the binder, click. This will create a new version of the binder. To save the binder so that it can be modified without creating a new revision, choose the button. When a binder is saved as a draft, only the creator of the binder will see this new potential version of the binder unless the security is specifically modified to allow others access. If you wish to cancel out, click Project screen. to return to the Citadon Customer Support Citadon CW Hours: 6am - 6pm PST 3. To add additional files to the binder, click. Table of Contents. Vu ipad. v2.6. Navigation. Document Manager. Sync Manager. File Access. Field Verification Measurements. Markups List. Using RSMACC version control system with AB Industrial programming Controllers and files. 1.1 Installing Protégé 3.3.1 You can follow the steps below to download and install Protégé 3.3.1 from the source. 1.1 Installing Protégé 3.3.1 You can follow the steps below to download and install Protégé 3.3.1 from the source. 1) Open Internet Explorer and go to the Protégé 3.3.1 web site at http://protege.cim3.net/download/old-releases/3.3.1/full/.